As the wheel of video distribution fortune spins around and around, where it will stop, is anybody’s guess. It used to be enough just to have the content to be king. Those days are over. Last week we introduced you to the idea of Subscription Aggregation as a possible remedy for OTT fatigue. This week we take a look at the possible implications of subscription aggregation in the near future. As the number of OTT offerings continues to climb, the opportunity to consolidate the management of these services on behalf of consumers is likely to accelerate as well. So-called OTT aggregators directly address the issue of subscription fatigue by allowing users to group multiple subscriptions under a single umbrella with one account, login, payment preference, and so forth. 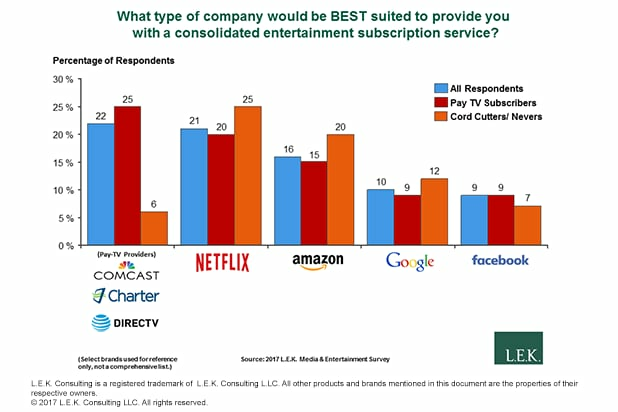 L.E.K.’s survey revealed strong interest in OTT aggregation: On a scale of 10, more than half of consumers rated such a service 7 or higher (see Figure 3). L.E.K. 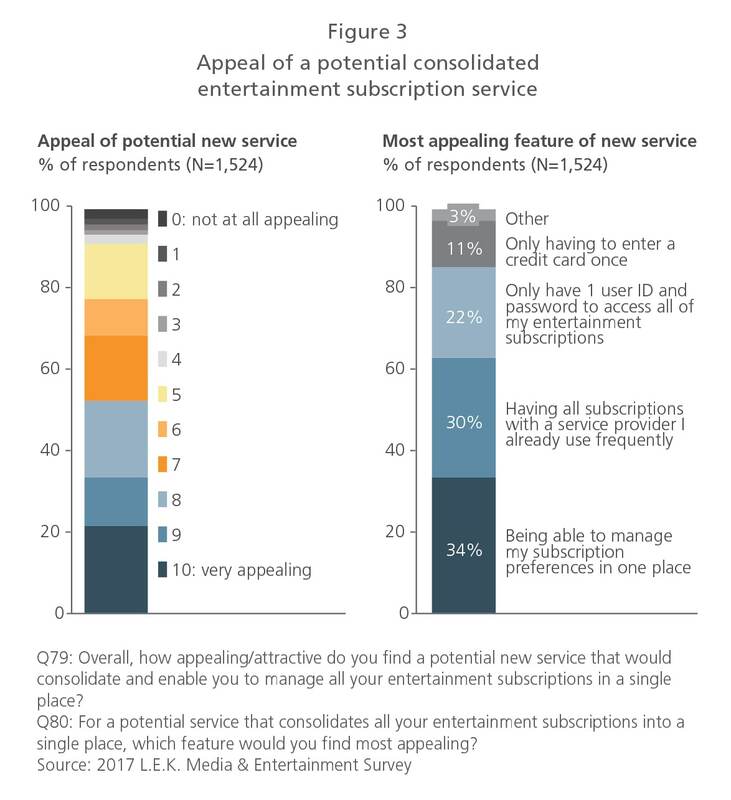 Consulting’s recent Media & Entertainment survey offers some insight into the growing subscription fatigue in the U.S. through OTT services. Who would be best equipped to act as service aggregator? Likely suspects vary according to consumer segment: While cord-cutters/ cord-nevers (who skew younger) named digital platforms such as Netflix and Amazon, by contrast, pay TV subscribers preferred pay TV providers (see Figure 4). - Going forward, it will become more difficult for providers to successfully launch a subscription video on demand (SVOD) OTT service without an aggregation play, especially when targeting oversubscribed Millennials. - Though the Millennial OTT market appears saturated, older customer segments (Boomer+) have been underserved to date. Accordingly, developing platforms aimed at the latter group may be a more effective strategy. - Considering aggregation as part of one’s overall distribution strategy will be more challenging for providers outside of the OTT Big 3 (Netflix, Amazon, Hulu), which must reach new consumers while ceding some revenue share as well as customer control. - While multichannel video distribution providers (MVPDs, or virtual MVPDs) are considered prime candidates for OTT aggregation, they will need to act quickly in order to avoid being edged out by Amazon, which has already positioned its Amazon Channels service as a potential aggregator (the same goes for Netflix, should it decide to enter the aggregation field as well). In short, all OTT stakeholders — including IP owners, OTT service operators/ service providers and MVPDs — should carefully weigh the above factors and subsequently develop appropriate strategies that may help improve their chances for success in this evolving marketplace. Check back each week right here on TheWrap for more from the Media & Entertainment sector of L.E.K. Consulting! We would love to hear from you! Have a topic you’d like us to address? Want to have your say? Then be sure to share your thoughts or ideas in the comments below! This is Part 2 in a series by Alex Evans and Dan Schechter from L.E.K. Consulting’s Media & Entertainment practice. Alex Evans, CFA, is a Managing Director in L.E.K. Consulting's Los Angeles office. He focuses on consumer-facing sectors encompassing both retail and media. He specializes in a diverse set of verticals, including Health & Wellness, Food & Beverage, Specialty Retail, Sports/Live Entertainment, Television and OTT/Digital Media.